The Red Sox dropped two of three to the Rays in Tampa Bay over the weekend. (But only one of the losses was a shutout!) Boston followed that up by getting swept at home by the Blue Jays. All that turned out to be prelude for the busiest trade deadline in team history. The home crowd sensed it: By the end of the Toronto series the night of July 30, with news of a Jon Lester trade already imminent, fans at Fenway Park were chanting “Jon-ny Lest-er! Jon-ny Lest-er!” as the Jays put the finishing touch on the sweep. It’s more complicated for Boston, obviously, but it all comes down to what you think of the Red Sox’ chances to contend in 2015. If you think they’re sunk and need to rebuild, sure, you lament the fact that you didn’t get prospects. I don’t think that’s the case however. I don’t think it’s at all unreasonable to think they’ll bounce back in 2015 and adding Cespedes to what has been a troublesomely non-productive outfield is a big boost in that regard. No, he was not indispensable in Oakland, but he’s coming to a good hitters park in Boston and represents a solid upgrade. On defense too, where he will be paired in the outfield with Jackie Bradley Jr., giving the Sox some awesome D in the outfield. The idea that Boston was looking toward 2015 was the conventional wisdom from several other observers too. The thing about prospects is that that’s exactly what they are. 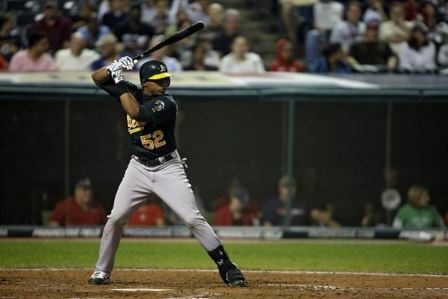 Cespedes is a proven guy that can really help this club in the coming yrs. On top of that reasoning, it was comforting to note that Cespedes’ 17 homers in 2014 would have been mostly of the ‘no-doubt’ variety if they were hit in Fenway Park. With news still settling on the Lester deal, word came Thursday early afternoon that John Lackey and his quite desirable $500k 2015 salary was headed to St. Louis in exchange for OF Allen Craig and pitcher Joe Kelly. Craig’s WAR as of yesterday was -0.4 as his batting average and OBP have taken a major hit due to some bad batted ball luck (.368 BABIP in 2013 vs. .281 in 2014). He has in theory, however, bounce back potential over the long-term although he is already 30 years old. Equally intriguing is Kelly, a 26-year-old right-hander with an underwhelming K/9 ratio but a high rate of ground balls induced. St. Louis has used him as a reliever for a portion of this season but his long-term value is as a mid-rotation starter who is still under club control for four more years. The Red Sox are in asset collection mode. Joe Kelly is a pretty nifty asset to collect, and Allen Craig is a lottery ticket who might be good, might be terrible, or might not last very long in Boston. There’s no way of knowing what the 2015 Red Sox are going to look like, but they’re doing a nice job of giving themselves options. Their current pieces don’t all fit together, but they’ve got another eight months to figure out who should stay and who should go. Craig’s only due $25.5 million over the next three years. So even if he only gets back to a 2-WAR level, he’ll be a good value. If he’s still limited by the Lisfranc fracture he suffered in his foot last year, perhaps another offseason of rest will help restore his old production. Was Lackey worth more than this given his salary for next year? Assuming he’s true to his word and won’t hold out or demand an extension, I think he was, yes. He’s worth $15-20 million for a full season on the open market. His thrifty contract makes him incredibly valuable for one year, perhaps even valuable enough that his team deserved a higher-impact player than either Craig or Kelly. The Red Sox and Giants struck a Saturday morning near-trading deadline special, with Jake Peavy headed west in exchange for pitching prospects Edwin Escobar and Heath Hembree, with the clubs splitting Peavy’s $5M remaining 2014 salary. As with most of this month’s trades to date, real, actual, solid prospects were netted by the selling club. In this case, they’re both pretty close to big league ready. Before anyone rushes to call this a clear win for the Giants – Peavy is 1-9, 4.72, for the season, after all – let’s take a closer look at what the Giants are getting, and how Peavy fits into his new environment. We wish Peavy luck in San Fran, where he should see a reversal of fortune thanks to a larger outfield in his home park that will potentially suppress a few homers over the final two months. As Blengino noted, that one win over the span of nearly four months can’t be blamed on a simple loss of stuff from Peavy. Truth be told, post-peak Jake Peavy was never a particularly good fit in Fenway Park. He has always been a fairly extreme fly ball pitcher, and that in general is not a good thing to be in that environment. Utilizing my own 2013 park factors, based on granular batted ball data, Fenway had the second highest fly ball park factor, at a whopping 151.1. It’s been ever worse in 2014, at 165.5. Routine fly balls often become doubles in Fenway. Overall, including all batted ball types, Fenway had the highest doubles park factor in 2013, at 125. Finally, the Sox let their two division rivals sweat it out a while on Thursday before dealing a couple of useful veterans to the Yankees and Orioles as they tool up for what could be a hotly contested AL East race. By the time news of these two deals came through just before 4 p.m., they almost felt like afterthoughts. However, the Red Sox acquired another top 100 left-handed pitching prospect from the O’s in 21-year-old Eduardo Rodriguez. Boston saves some cash by sending the remaining two months of Stephen Drew’s contract to New York in exchange for Kelly Johnson. Any other year, this could be looked upon by cynics as the team unnecessarily aiding its biggest rival. But with Oakland adding Lester to its staff and Detroit swinging a trade for David Price, the marginal upgrade of adding Drew does little to shift the balance of power in the American League pennant race away from three clear favorites in Oakland, Detroit and Anaheim. Former Red Sox GM Theo Epstein acquired Felix Doubront from Boston on Wednesday in exchange for a player to be named later. A sly move on Epstein’s part, he gets a durable left-handed starter for what is likely to be pennies on the dollar. One More Year of Koji? For those lamenting a less recognizable roster in 2015, Sean McAdam reported Monday that executives in the industry expected the Red Sox to extend a qualifying offer to Koji Uehara for 2015. The club resisted the urge to deal the closer as part of its myriad dealings yesterday, electing instead to retain him for the remainder of the season in order to keep its qualifying offer in tact. If the Sox dealt Uehara, there would be nothing to stop them from attempting to re-sign him after the season, as they might do in the case of a trade involving either Miller or Lester…But they would lose the mechanism of the qualifying offer and have to compete with other teams, some of whom might be willing to give him more than a year. If the Sox hold onto Uehara and he’s offered $15 million for next season, it’s inconceivable that he would turn that down. Could Christian Vazquez Be the Goods? It took an advanced receiver to effectively manage the likes of Allen Webster on this day. Webster featured a heavy sinker and was all over the strike zone, in and out, throwing 42 strikes and 44 balls. A handful of those strikes were a figment of the umpire’s imagination, a credit to Vazquez’s confident, delicate pitch-framing ability…. Throughout the game, however, Vazquez handled every type of pitch beautifully – and in various locations. He set up quietly, displaying his target with ideal timing, was visibly invested in the batter’s setup, and in charge of the pitcher at every turn. Additionally, he manipulated and condensed his body to present an ideal target. With the influx of pitching talent on its way to Boston over the past week, it’s nice to know that the team has two of the game’s best catching prospects in Vazquez and Blake Swihart. This entry was posted in Red Sox and tagged Jake Peavy, Jon Lester, Koji Uehara, Yoenis Cespedes. Bookmark the permalink.